It was quite a week for winners and take a look at some of the place-and-show prices, a few connected to exactas, in the horses-to-watch (H2W) list results below. Our successes in non-features continue to endorse the great across-the-board and exotic plays you can find through us for your TwinSpires harness bankroll. Also last week, we delivered half of the winning quartet in Buffalo Raceway’s TwinSpires bonus Pick 4 (Feb. 26). Once again we gave you the highest payer of the four races with Lucky Millionaire ($22.60, $5.40, $3.50) and week added the second-leg winner, My Future Ex ($6, $2.80, $2.80-ok). Every Wednesday night TwinSpires’ 10-percent-bonus Buffalo Raceway 50-cent Pick 4 wagers continue. We assist with suggestions for your ticket via Twitter -- @FrankCotolo, @TwinSpires and @BuffaloRaceway. Our featured overnight choices included a big winner at the Meadows in Pop Cop ($33.60, $12.20, $4.60). At Flamboro, one of our two choices was second (Justabitevil, $4.60, $3.30; Exacta with public-choice winner $12.10). Our second choice in the other Flamboro non-feature was second (Northern Triumph, $4.80, $3.30). The Meadowlands released its 2014 winter book for the Meadowlands Pace. Top sophomore pacers include frosh-pacing champ Hes Watching and runner-up Luck Be With You. Several other colts are Some Major Beach, a half-brother to the great Somebeachsomewhere, the sire of last year’s Meadowlands Pace winner Captaintreacherous. Tony Alagna trains both. Beginning Monday, March 3, and continuing with just one exception through Oct. 31, all post times at Monticello Raceway will be at 12:50 p.m. The exception occurs on Friday, July 4 when post time will be 5:30 p.m.. Live racing during the month of March will continue four times weekly on the afternoons of Monday, Tuesday, Wednesday and Thursday. Flamboro Downs advises that their post times for Saturdays have been changed from 1 p.m. to 6 p.m. Still, the March 22 will remain at 1 p.m. due to a fund raiser being held at the facility. After joint consultation, Jim Simpson, President of Hanover Shoe Farms and majority owner Jeff Snyder have decided to retire Cams Card Shark from active stallion duty. 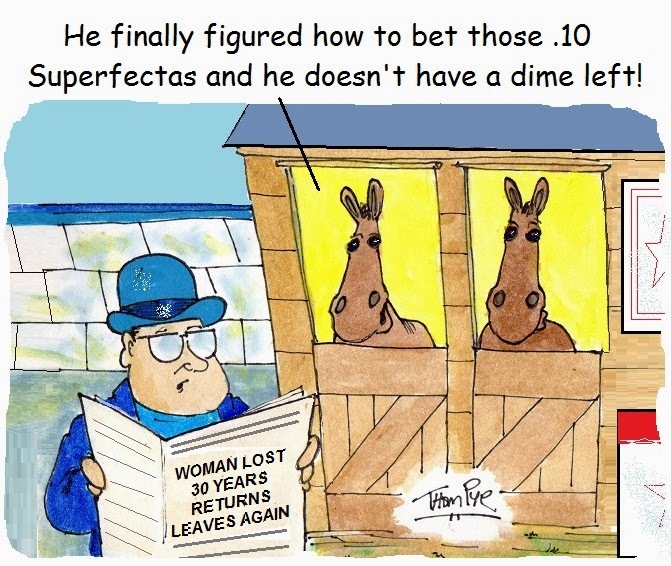 Simpson said, “He has now reached the stage in life where it is both difficult and dangerous for him and those around him to mount the phantom mare or even to be collected using a live mare.” Cams Card Shark was syndicated at the end of 1994 and retired with career earnings of $2,498,204. His stallion accomplishments include 10 millionaires including five who have earned in excess of two million dollars. He is credited with three Little Brown Jug winners and two winners of The Meadowlands Pace. His most renowned performers have been Shark Gesture, Bettors Delight, Four Starzzz Shark, Royalflush Hanover, Holborn Hanover, Roll With Joe, Village Jolt and Million Dollar Cam. For serious followers of bloodlines come this remarkable fact: Cams Card Shark’s son, Bettors Delight, is the fifth great stallion from a paternal line that follows from Meadow Skipper through Most Happy Fella to Cam Fella to Cams Card Shark and now Bettors Delight. This is a feat unprecedented in standardbred and thoroughbred breeding. It’s quite possible that the line will be extended through his grandson Betterthancheddar. Rosecroft Raceway’s 65th anniversary race meet will kick off with a 27-date winter-spring meet beginning March 8 and going through June 7. Harness racing will be offered every Tuesday and Saturday evening with a 6:40 p.m. post time. A total overnight purse schedule of over $70,000 per day will be offered, including a 15-percent bonus on earnings for any Maryland owned, sired, trained or foaled horse that finishes first through fifth in an overnight race during the meet. In honor of St. Patrick’s Day, Freehold Raceway will be the scene of a special race featuring drivers of Irish heritage on Saturday, March 15. The winner of the race receives a blanket and a trophy. The drivers scheduled to participate in the race are Jack Baggitt, Jr., George Brennan, Corey Callahan, John Sheehan, John McDermott, plus a trio of native Irish drivers Joe Hanney, Anthony Haughan, and Jonathan Dunne. They Irish trio is a reunion celebrating years of driving and training together throughout Ireland, England, Canada and the United States. Dunne holds the driving title in his country as well as in the UK. Haughan is a top driver in Canada. This will be the first time driving for Haughan and Dunne at Freehold .